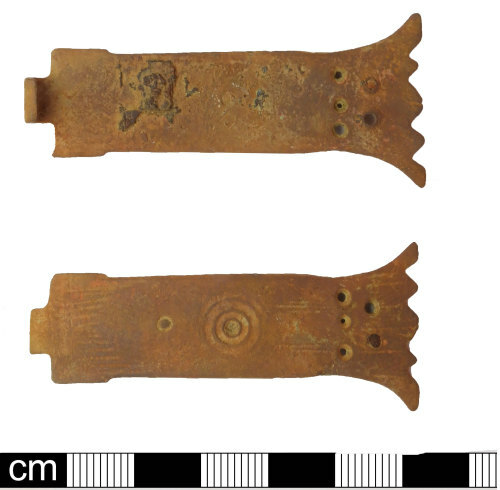 An incomplete post-medieval copper alloy book clasp, probably dating to c. 1500-1650. The front plate of the clasp survives. It is rectangular in shape, narrowing to a slimmer rectangle, before flaring to an elaborate terminal which is triangular in shape, with four triangular notches placed in two pairs on the terminal end. At the opposite end is a flattened rectangular curved attachment hook, which curves over to the reverse. The reverse itself is marked by the degraded base of a further point of attachment, approximately 1/3 of the way along the length of the clasp. The clasp is decorated on the exposed outer surface. A stamped decoration of a square labyrinth begins the series of motifs, followed by an annulet. This is followed by a series of concentric circles (possibly a circular labyrinth) and the series ends with a group of five circular punches, arranged as a trio, then a pair. "The form and decoration are typical of book clasps of the early post-medieval period, as discussed by Margeson (1993, 74)." It is 60.3 mm in length, 15.2 mm in width, 1.7 mm thick and weighs 10.86g.